So Zach took the following picture one day. 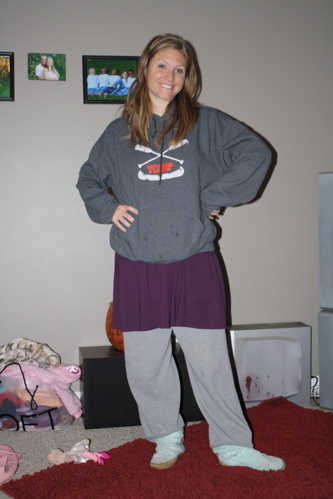 Sometimes I even surprise the man I’ve been married to for nearly a decade at my fashion-forward sense. But actually, Zach took this picture for probable bribery reasons. Perhaps this is why I’m always watching TV and laughing at the “stay at home moms” portrayed. Really? I haven’t seen high heels in my house for months and I only put on make up when I’m feeling particularly frisky. This is motherhood. This is a day when you start out wearing cute PJs (purple) and then find out it dropped 30 degrees overnight. This is also when you just remembered it’d been one…maybe two days since you last showered. This is the outfit you wear in this job where at any moment you might be plunging poop out of a toilet, getting puked on, doing 10 loads of laundry and 20 minutes of dishes. This is my uniform. What’s yours? I adore this. Really. I actually had to call and ask my mother to come over yesterday so I could shower (I keep staying up late reading our new bookclub book and can't get out of bed until Jared leaves for work). Personally I don't think we get any sexier than this. Love to you. Tesi I always do the same thing! Start out with a cute little nightie and eventually add Several layers of comfort clothes! And shower? What's that? Best job in the world though! Wouldn't trade it for a million bucks! Sadly, I go to my office job looking not a whole lot better. Love it, my look is quite similar to yours. I wear make-up so little these days that when I do, my eyes reject it and turn red and itchy. Tesi…reminds me of that summer we went, um, days without showering and were quite proud!